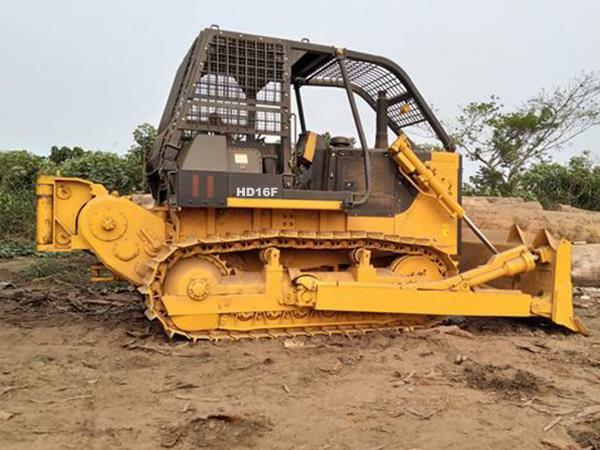 HD16F forestry logging bulldozer was developed in response to the demands of forest working environment,it adopts the hydraulic drive and hydraulic control technologies, featuring advanced and reasonable structure, stable performances, and light and flexile operations. The forward extended rollover protection structure can effectively protect the whole machine. 1,The standard forestry logging blade can powerfully remove all kinds of bramble obstacles along the logging path to achieve high lumbering efficiency of the bulldozer. 2,The winch equpped on the rear of the dozer and it is used for traction of the wood and self-rescue of the bulldozer during the logging operations.The powerful traction force guarantees high operation efficiency and the unique self-rescue function of the winch guarantees the machine's safety. 3,HD16F forestry logging bulldozer equipped with special ROPS canopy or cabin for logging and it can protect the operator's saftey well. Haitui bulldozer factory covers around 40000㎡ and have more than 100 workers.The new plant composed by spare parts area,assemble workshop,testing area and office building.The annual production capacity can reach 2000 units crawler bulldozers to meet the demand of domestic and internation market.